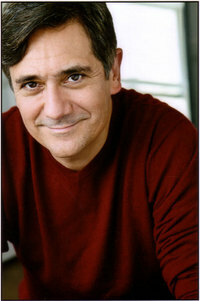 Carlos LaCamara (pictured) is one of America's most talented playwrights and one of his great works, Havana Bourgeois is coming to South Florida - Coral Gable's Miracle Theatre (May 2009). This timely and riveting play by this super talented Cuban-American writer is almost certain to be one of Miami's best, ever. One, if not the most important reason for such success will be the gay character he penned in this play which takes place in an advertising agency in the 1950's. Carlos was nominated for a GLAAD award because of the incredible dignity and respect he bestowed to this character. This type of great writing transcends any and all cultural boundaries as the universal themes apply to everyone - gay or straight. Playwright Carlos LaCamara speaks about Havana Bourgeois,the tragedy the comedy and something for everyone. black messenger boy, MANUEL, president of the company. dries up and executions play on television. progressive ideals with his crumbling middle class lifestyle. to make: Does he do his patriotic duty and report Alberto? Or does he allow his friend to escape?